30 Jul 2011, 9Y-PBM, 737-800, 29635/2326, FF 06 Jul 07, Caribbean Airlines; Georgetown, Guyana. The approach was a normal RNAV approach, in rain, at night onto Runway 06 (2270m) at Cheddi Jagan International Airport (CJIA). The Captain was PF. Conditions on approach and over the runway were conducive to visual illusions. These conditions include the lack of approach lights, the featureless terrain, rain on the windscreen, the shallow approach path that was engendered by the glide slope angle of the beam projection of the PAPIs, and wet and sloping runway. Notwithstanding both flight crew members’ familiarity with conditions at the CJIA, they may have been affected by these visual illusions. Visual refernces were obtained and the automatics disengaged. Upon reaching minimums the captain expressed doubt about the airplane’s approach profile and remarked that the airplane was slightly low on the glide-path. He then increased power to 65% N1 to correct the glide-path, this thrust was maintained for approximately the first 2000ft of runway. The captain did not reduce power during the flare and the copilot did not notice or call out the excess power during the flare. As the flight continued over the runway, the captain indicated to the FO that the aircraft was not touching down. A go-around call was made by the Captain 16 seconds after crossing the threshold and acknowledged by the First Officer, however the aircraft touched down 3s later 4700 feet beyond the runway threshold, leaving just over 2700 feet of runway surface remaining. After touch down, the captain did not apply maximum available reverse thrust or braking. The ground spoilers deployed at touchdown. The thrust reversers deployed as commanded by the crew to a position between idle and Detent 2 reverse thrust approximately three seconds after touchdown and 2000ft from the end of the runway. The Detent 2 reverse thrust position assumed in the QRH estimates was never commanded by the flight crew. The final position of the aircraft was approximately 130ft from the end of the paved surface of RWY06 and 64ft off the extended runway center line. The aircraft suffered damage beyond economic repair. It broke into two sections in the vicinity of the first class bulkhead. Both engines were destroyed by the impact and FOD ingestion. There was no post-crash fire. There were no fatalities. One passenger suffered a broken leg which resulted in an amputation. Several other passengers and crew suffered minor injuries during the accident and evacuation. On 30thJuly, 2011 Caribbean Airlines Flight BW523, a Boeing 737-800 aircraft, with 157 passengers and a crew of six, departed Piarco International Airport, (TTPP), Port of Spain Trinidad at 04:36hrs Universal Coordinated Time (UTC) on an instrument flight rules (IFR) flight plan on a scheduled flight to the Cheddi Jagan International Airport (CJIA), ICAO identifier: (SYCJ), Timehri, Guyana. The aircraft landed at CJIA on runway 06 (RWY06) in the hours of darkness at 05:32hrs UTC, following an RNAV (GPS) approach. The reported aerodrome weather conditions were at 05:00hrs - wind calm, visibility 9km, light rain, few clouds 1400ft in cumulonimbus clouds, broken at 1500ft, QNH 1009hPA. The aircraft touched down at approximately 4700 feet of the 7448 feet long runway, some 1700 feet beyond the runway touchdown zone. The runway was wet. The crew was unable to stop the aircraft on the remaining runway surface and it exited the end of the runway approximately 20ft left of the center line, breaking through a fence and coming to rest on the bottom of a 20ft high earth embankment. The final position of the aircraft was approximately 130ft from the end of the paved surface of RWY06 and 64ft off the extended runway center line. The aircraft suffered damage beyond economic repair. It broke into two sections in the vicinity of the first class bulkhead. Both engines were destroyed by the impact and foreign object debris (FOD) ingestion. There was no post-crash fire. There were no fatalities. One passenger suffered a broken leg which resulted in an amputation. Several other passengers and crew suffered minor injuries during the accident and evacuation. The flight originated in New York as BW 523, and made a passenger and fuel stop in Port-of-Spain, Trinidad where there was also a change of crew comprising two pilots and four flight attendants before proceeding to Georgetown, Guyana. The flight departed Piarco at 04:36UTC. The aircraft proceeded to Georgetown from Port of Spain at Flight Level (FL) 330, was given descent clearance and was cleared for an RNAV (GPS) approach to RWY 06, landing at 05:32 UTC. There were no reported anomalies in the en-route profile, although during the transition from cruise to approach to RWY 06 the aircraft deviated to avoid some thunderstorm cells north and east of the Airport. The reported visibility was 9,000m. Light rain was encountered during the approach. The pilot reported that after visual contact was made and after crossing the Final Approach Fix (FAF), he disengaged the auto pilot and configured the aircraft for landing. The Flight Data Recorder (FDR) indicated that the flight was normal until the aircraft was approaching the runway. Even before the aircraft was over the threshold, the captain commented that he was not landing here. As the flight continued over the runway, comments on the Cockpit Voice Recorder (CVR), revealed that the captain indicated to the First Officer (FO) that the aircraft was not touching down. A go-around call was made by the Captain and acknowledged by the First Officer, however three seconds elapsed and the aircraft subsequently touched down approximately 4700ft from the threshold of RWY06, leaving just over 2700 feet of runway surface remaining. Upon touchdown, brake pressure was gradually increased and maximum brake pressure of 3000psi was not achieved until the aircraft was 250ft from the end of the runway or 450ft from the end of the paved area. The ground spoilers were extended on touchdown. The thrust reversers were partially deployed after touchdown. The aircraft did not stop and overran the runway. It then assumed a downward trajectory followed by a loud impact. The aircraft suffered damage beyond economic repair. It was fractured at the first class bulkhead, with the cockpit portion resting at a 30° angle to the rest of the fuselage which was resting angled up at about a 10º angle from horizontal. The nose landing gear had collapsed underneath the cockpit and was pushed backwards into the fuselage where the avionics and electronics are typically housed. The fuselage, from the radar dome to about ten feet aft of the nose, was damaged and crumpled from impact. The thrust reverser doors were partially deployed on both engines which were severely damaged by impact and FOD ingestion. The Captain was aged 52 and had 9,600hrsTT inc 5,000hrs on type. The FO was aged 23 and had 1,400hrs TT inc 350hrs on type. The RNAV-GPS approach procedure aligns the aircraft on the RWY06 extended center line at position AKSIN, 11.2nm from the threshold at an altitude of 3000ft AMSL. The aircraft will continue the approach to cross the Final Approach Fix, position OLVIK, located 5.2nm from the threshold, at 1800ft. Thereafter the aircraft will make a continuous descent on a 3º slope to a Minimum Decision Altitude of 380ft AMSL. After this, approach and landing is completed by visual reference to the ground. If visual reference is not acquired when the aircraft reaches 380ft AMSL a MAP is carried out. Caribbean Airlines Flight, BW523 was properly configured for landing at Georgetown, Guyana, early in the morning of July 30, 2011. There was no evidence of an aircraft malfunction, and the aircraft reached the runway threshold close to the QRH reference speed of Vref =149kt. The aircraft touched down approximately 4700ft down the runway, leaving 2900ft of pavement to stop on. The touchdown was 3700ft beyond the runway “aiming point” (or fixed distance marker) and 1700ft beyond the runway touchdown zone for landing operations. Assuming good braking on a wet runway with an average aircraft braking coefficient of 0.2, the aircraft could not have stopped before reaching the end of the runway using Auto-brakes 3. The captain carried a power setting of 65% N1 for approximately the first 2000ft of runway. The high power setting explains the excessive float during the flare reported by the crew as well as the long touchdown. 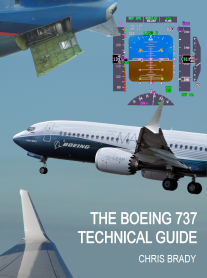 Boeing was able to match the flight’s performance with their B737-800 simulation using the recorded FDR inputs. When the TLA’s were reduced to flight idle at 20ft AGL in the simulation, the aircraft touched down over 1700ft sooner than with the actual FDR TLA’s. Boeing also used the simulation to show that it was possible to remain on the runway using Detent 2 reverse thrust. The ground spoilers deployed at touchdown. The thrust reversers deployed as commanded by the crew to a position between idle and Detent 2 reverse thrust approximately three seconds after touchdown and 2000ft from the end of the runway. The Detent 2 reverse thrust position assumed in the QRH estimates was never commanded by the flight crew. The analysis of the FDR shows that while on short final the aircraft was sinking below the desired glide-path and the crew increased power. The airplane regained the glide-path, but the pilot did not reduce power as the airplane entered the flare. The excess power resulted in the aeroplane floating beyond the intended touchdown point. Power was not reduced until the airplane was approximately 4000ft down the runway, about 6 seconds before touchdown. 3 seconds later the pilot called a go-around and advanced power, which contributed slightly to the float. However 3 seconds later the wheels touched down. BW523 had approximately 2900ft of pavement to stop on when it touched down, 4700ft down the runway. Boeing’s landing distance estimates using a calculated aircraft braking coefficient as a function of groundspeed indicate that it was possible to stop the aircraft on the runway using either Detent 2 or maximum reverse thrust. However the ground spoilers were armed and as a result deployed at about the time of touchdown at 05:32:12 and the thrust reversers deployed (less than Détente 2 was commanded by the crew) 2 seconds later at 5:32:14 when the aeroplane was 2000ft from the end of the runway. Further the crew applied gradual brake pressure starting at touch down, maximum brake pressure of 3000psi was not achieved until the aircraft was 250ft from the end of the runway. Because the aircraft touched down so far down the runway and the crew did not use all of the available deceleration devices, it was not stopped on the paved surface and exited the prepared surface of the runway and impacted a berm resulting in substantial damage to the airframe. The probable cause of the accident was that the aircraft touched down approximately 4700 feet beyond the runway threshold, some 2700 feet from the end of the runway, as a result of the Captain maintaining excess power during the flare, and upon touching down, failure to utilize the aircraft’s full deceleration capability, resulted in the aircraft overrunning the remaining runway and fracturing the fuselage. The Flight Crew’s indecision as to the execution of a go-around, failure to execute a go-around after the aircraft floated some distance down the runway and their diminished situational awareness contributed to the accident. 1. The aircraft executed a non-precision approach to RWY06. 2. The pilots reported that the wind screen wipers functioned effectively. 3. There was no reported malfunction of any systems within the cockpit prior to the accident. 4. The pilot increased power on short final to maintain glide path and did not significantly reduce power when crossing the runway threshold. 5. Although the wind was calm the FDR recorded a 180° wind shift when the aircraft was on short final. However, at the time of the shift in wind direction, the wind magnitude was less than 5kts and had minimal effect on the aircraft. 6. The pilot reduced power briefly, then increased power slightly three seconds before touch down. 7. The excess power resulted in the aircraft touching down approximately 4700ft from the threshold of RWY 06. 8. The readings from the FDR indicate that the lifting devices functioned effectively. 9. The ground spoilers were extended on touchdown. 10. Tests carried out by Boeing indicate that the spoilers worked properly during landing. 11. The pilot applied reverse thrust between IDLE and DET 2. 12. Calculations by Boeing and NTSB indicated that the aircraft’s braking systems functioned satisfactorily. 13. The crew did not command maximum brake pressure of 3000psi until the aircraft was 250ft from the end of the runway or 450ft from the end of the paved area. 14. The vehicle performance study shows that under the event conditions, the aircraft could have safely stopped on the remaining pavement had the crew applied DET 2 reverse thrust or maximum manual braking immediately after touchdown. 15. The wet surface of the runway did not inhibit good braking ability. 16. The aircraft did not stop and came to rest approximately 130 feet off the end of the runway and 64 feet left of the extended center line. 17. Had the crew touched down within the touchdown zone and applied stopping devices as they did, the aircraft could have stopped on the runway remaining. 1. The flight crew possessed the necessary licenses and qualifications to perform the flight. 2. The flight crew flight and duty time commenced approximately two hours before the accident occurred. 3. The off duty/rest time provided by the Company was in keeping with the requirements of its Operations Manual. 4. Although sighs and yawns were recorded on the CVR; there is insufficient evidence to determine if the effects of fatigue contributed to this accident. 5. The captain and copilot were very different in age and experience, and had not been paired together previously. However they were both familiar with operating conditions at CJIA as they had previously done several flights here with other crew. 6. The crew executed a non-precision approach to RWY06. 7. Conditions on approach and over the runway were conducive to visual illusions. These conditions include the lack of approach lights, the featureless terrain, rain on the windscreen, the shallow approach path that was engendered by the glide slope angle of the beam projection of the PAPIs, and wet and sloping runway. Notwithstanding both flight crew members’ familiarity with conditions at the CJIA, they may have been affected by these visual illusions. 8. Upon reaching minimums the captain expressed doubt about the airplane’s approach profile and remarked that the airplane was slightly low on the glide-path. He then increased power to correct the glide-path. 9. The captain did not reduce power during the flare. 10. The copilot did not notice or call out the excess power during the flare. 11. From the CVR it was noted that 16 seconds after crossing the threshold, the captain made a go-around call and briefly increased power, the copilot acknowledged the call. 12. The captain then decreased power as the airplane touched down and he did not follow through with the go-around. 13. After touch down, the captain did not apply maximum available reverse thrust or braking. 14. The cabin crew did not attempt to activate the rear emergency light switch. 15. There was poor coordination (CRM) during the landing phase, a critical phase of flight, the CVR did not record any positive actions from the flight crew, towards the end of the flight. 1. The need to confirm with and operate within Standard Operating Procedures must be emphasized during training. 3. CAL must train pilots on the appropriate use of maximum reverse thrust, spoilers and maximum manual braking. 4. The importance of decision making must be emphasized in initial and recurrent training. 5. CRM training must be reviewed to address the roles of the pilot flying and the pilot monitoring especially in relation to the call for “GO AROUND” when it is observed that an aircraft does not touchdown in the touchdown area. The CAL Operations Manual Part A, clearly outlines when a “go around” call must be made and although not applicable to this accident CAL should consider emphasizing that either flight crew member can make the “go around” call and the response to this must be immediate. 6. CAL should conduct an analysis with their pilots to determine their understanding of go around from flare to touchdown and when a go around is mandatory. 7. CAL must reinforce training with regard to recommended flap setting for wet runways. 8. CAL must develop procedures for flight crew to check charts for landing on wet runways. 9. CAL must provide proactive training in TEM and Visual Illusions Awareness. 10. CAL should review the guidance provided by ICAO in Annex 6 to the ICAO Convention on Fatigue Risk Management Systems. 12. Based on the fact that the combined efforts of two cabin crew did not allow them to properly open the L2 door, there is the need to review cabin crew training to ensure that they are aware of the correct procedures that are pertinent to operating the exits when aircraft are in an unusual attitude. 13. CAL to consider placement of additional information on the Safety Briefing Card to include directions for the safest and easiest way to get off the aircraft wings and what to do after getting out of the aircraft. Note should include warning not to touch the engines cowlings in order to avoid burns. 1. Carry out a full review of the CAL flight crew training program to ensure that it is in keeping with the Boeing program. Emphasis must be put on decision making, situational awareness and CRM. The company will also benefit by placing greater emphasis on TEM. 2. In reviewing CAL flight crew training programmes, TTCAA must ensure that the required flight and ground training is carried out and properly documented. 3. Cabin crew training needs to be reviewed to ensure it is in keeping with requirements of the Training Manual. 4. Generally, TTCAA should review CAL’s record keeping to ensure that documents are properly completed including sign off and dating. 1. In the planned extension of the Runway at SYCJ the development of RESA in keeping with ICAO Annex 14 must be included. Also the use of EMAS (Engineered Materials Arrestor Systems) should be considered. 2. Approach lighting and Touchdown zone lighting and center line lighting should be included as part of the extension plans for the airport. 3. SYCJ should provide an easily identifiable area that is set aside to provide comfort to passengers, who may be in distress, and their relatives. 4. 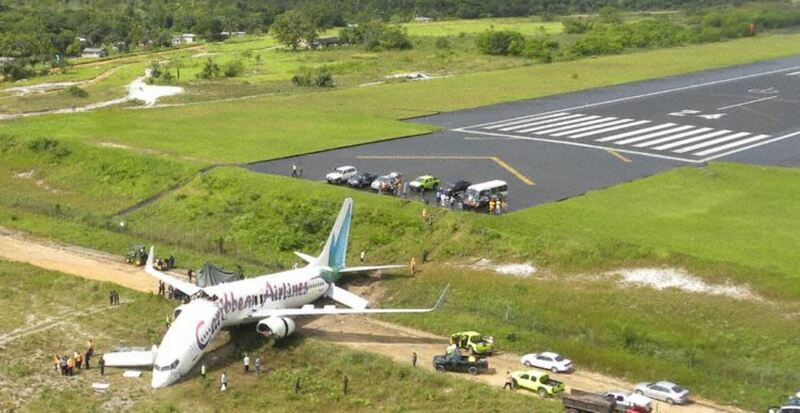 The airport should arrange for an engineering assessment of the runway slope and provide notification for publication of same in the Guyana AIP. 5. It was noted that there was no reaction from the Airport Security Service. SYCJ must carry out an investigation to determine why there was no reaction and implement training exercises to familiarize its security service with its responsibility in keeping with the Airport Emergency Manual. Consider need for a meteorological officer to be stationed at a strategic location on the field to provide local weather information.